Disclosure: I received a stroller for review from Combi. All opinions are my own. 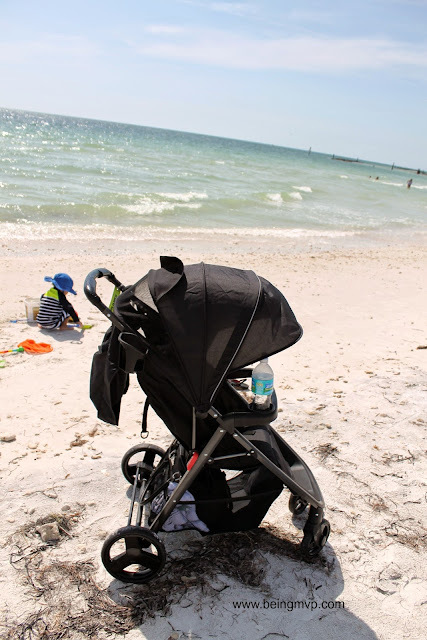 Combi just released the Fold N Go single stroller and I was excited to bring it along on our Florida vacation. It was super quick to assemble and we were ready to roll in no time. This is a really light full-size stroller weighing it at only 16.3 pounds. I had no problem taking it through the airport and gate checking it and it was ready to go on an adventure with us. 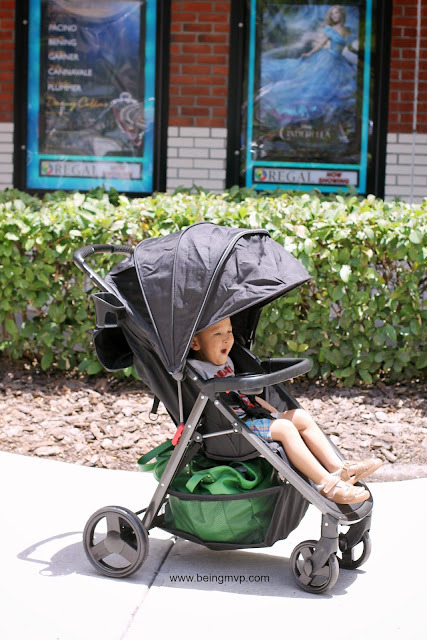 What's nice about this Combi stroller is extra large canopy with mesh ventilation window. Very convenient in summer weather in both CA and FL! The padded seat is comfortable for your child and the 5-point harness keeps them secure. The large basket is perfect for stuffing in a huge diaper bag plus necessities as well as shopping bags. 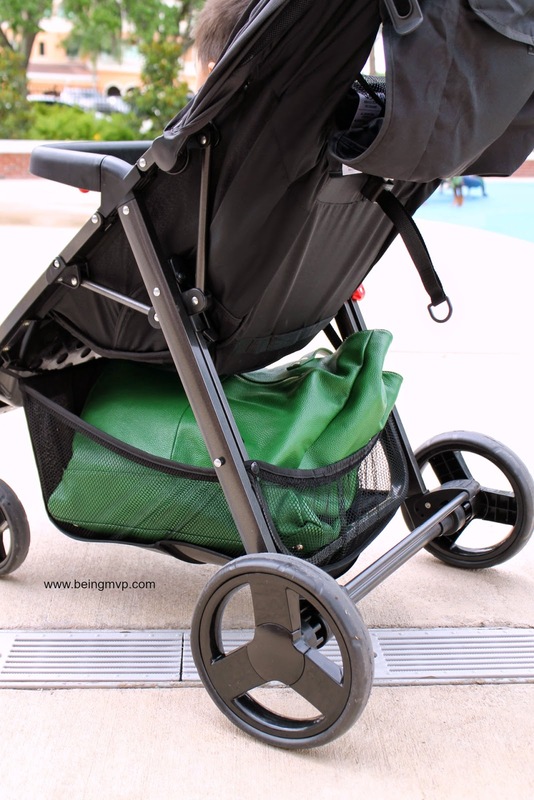 The one-hand fold is really convenient when you have an infant or tot because you can hold them with your other arm and easily place the stroller into the trunk after your day. The suspension is fantastic as it rolls easily on most surfaces with minimal bumps. When your child gets sleepy, it is easy to recline so they can rest. The child cupholder on the removable child tray is awesome and much needed when you have a toddler. I like the parent cupholder as well because it is sturdy and easily holds my Starbucks! Have you been searching for an affordable, light-weight, full-size stroller that is easy to use? Check out the Combi Fold & Go Single stroller! 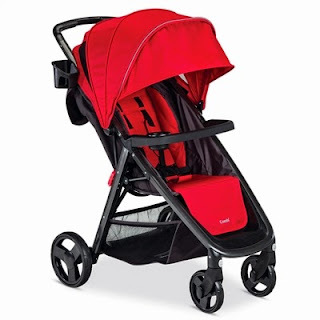 One winner will Receive a Combi Fold & Go Single Stroller! The Cosmo E stroller is also nice! The F2 stroller looks awesome! I can't believe it's just under 8 pounds. It looks like the perfect travel stroller! i love the cosmo stroller! I also like the all in one mobile entertainer. I like the Coccoro Convertible Car Seat! I like the Fold N Go Double. I really like the Shuttle Infant Car Seat. I love the Coccoro Convertible Car Seat from the site. I would also like to have their Coccoro Convertible Car Seat. i like the Shuttle Infant Car seat for the great base and easy release of the seat. I love the Go and Grow Walker, Play Table & Chairs. I love items that grow with the child. I'd love to have the Coccoro Convertible Car Seat. It looks really safe and comfy! I also love the Combi Coccoro Convertible Car Seat too, would love to have this! I love the F2 stroller! the coccoro convertible carseat looks great! ive read some awesome reviews. plus great colors to boot! I would love the Go and grow walker, table and chair set. Also the F2 would be awesome. Oh how I would love to have this for our baby girl! Btw, the Pod Bouncer is uber adorable!! I like the Fold N Go Double as well! Coccoro Convertible Car Seat is really nice love to have one. I like the Coccoro Convertible Car Seat. I like the Go and Grow Walker, Play Table & Chairs.